Find your next favourite craft beer at one of these go-to spots. Ontario is a hub for the craft brewery scene with 277 breweries throughout the province. From creamy, chocolaty stouts to biscuity, amber ales, IPAs and Saisons you can treat yourself to some of the best beers in the country. Find your next favourite craft beer at one of these go-to spots throughout south and central Ontario. Brock St. Brewing Company’s mission to create amazing beer using all-natural ingredients (water, malted barley, hops and yeast). Their Brock Street Chocolate Milk Stout was recently awarded a gold medal at the 2018 Canadian Brewing Awards. Not to mention the Brock Street Amber Lager and the Brock Street Traditional Bock that both brought home silver. Brock Street Brewing Company founder Mark Woitzik and his partners Chris Vanclief and Victor Leone of Whitby, and Scott Pepin of Ajax initially opened the brewery in 2015. They are now set to open 17,000 square foot production facility, sampling bar, and banquet facility in Whitby’s Historic Downtown. Originating in Hockley Village this brewery is a fixture in Orangeville and the home of Hockley Dark English Ale, one of Ontario’s best-selling craft beers. Founded by Tom Smellie, an avid advocate for exceptional beer who can be found spreading the word throughout Canada. 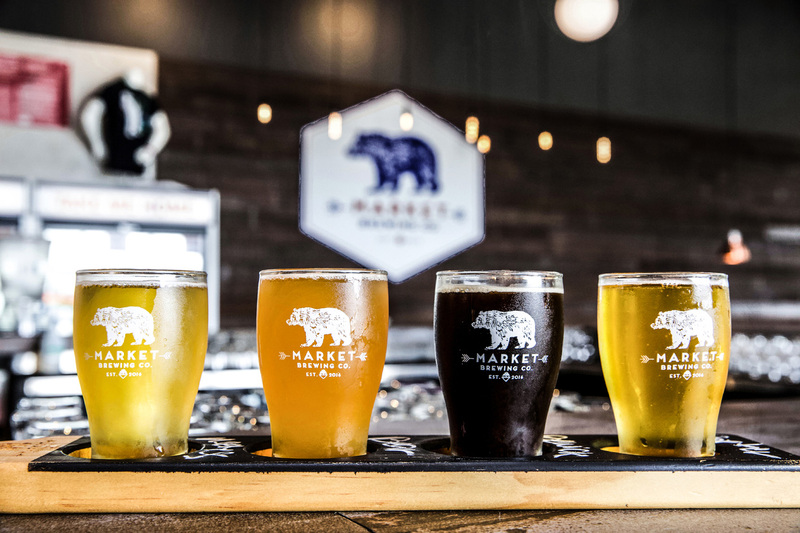 Markham’s first craft brewery, Rouge River Brewing specializes in hop forward American-style ales, sour beers, as well as Belgian Farmhouse-style ales. Visit their tasting room to sample the beers they currently have available, and stay for a pint or taster flight. You can shop their retail store and bring their delicious beer home with you as well! Be sure to check out their website for upcoming events. Craft Beer on Tap at Rouge River Brewing Co. Created by husband and wife team, Rob Garrard and Joanne Richter, Second Wedge Brewing Company is located in the heart of Downtown Uxbridge. The couple combines their love of the Oak Ridges Moraine, its fresh water sources and a desire to bring the best beer to their downtown area. Second Wedge Brewery offers a tasting room with a selection of brews on tap. With over 26 brews under their belt, Manantler believes creating beer is more art than science. Founded by friends James Gorry, Daniel Almeida, Oliver Ward and Chris Allott, who opened the brewery in 2015. Located in Bowmanville, the brewery is open every day, and their website offers a listing of times for tours and tastings. Dedicated to creating the best traditional, German-inspired handcrafted lagers and ales, Old Flame Brewing is located in the former Ontario Carriage Works in Port Perry. The brewery, founded by Jack Doak was opened in 2014 and uses premium hops, grains and the finest yeast strains to create their small batch beers. Friends since high school and both serial entrepreneurs, Shane and Josh shared a vision to build a community hub where people could feel proud to show up and share moments with their loved ones and friends as well as producing premium, high-quality beer in house. After recruiting award winning brewer Ethan Allured who moved across the country to be a part of the movement – the three came up with the Market Brewing Company. GoodLot Farmstead Brewing is the first farm-to-barrel brewery in the Greenbelt – Ontario’s finest agricultural region. They make fresh, super-local, estate-quality ales & lagers, using hops raised on their own farm. Embracing a holistic approach to agriculture, they create high-quality organic brews made from nutrient-dense ingredients. The GoodLot bottle shop + beer garden is set to open mid-October, 2018. You’ve Read the Profiles – Now Watch the Videos! There’s more than meets the eye at your favourite small-town fairs. If you’re looking for ‘road-trip worthy’ food experiences, look no further than York, Durham, Headwaters!